Here’s what’s up in the world of TV for Wednesday, October 3. All times are Eastern. 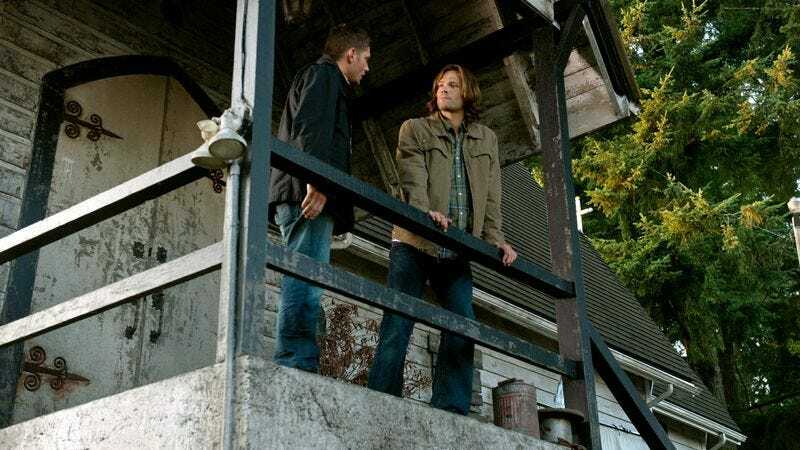 Supernatural (The CW, 9 p.m.): While the rest of America is watching two men argue over the future of this great nation, Phil Dyess-Nugent invites you to watch two men fight monsters. Now, we could make some sort of super-obvious joke about the intersection in the Venn diagram between “monsters” and “politics,” but none are occurring to us, so Phil and all of us here as What’s On Tonight invite you to make a “presidential debate”/Supernatural crossover joke, preferably involving the word “Nosferatu” in some form or another. Though making that a requirement is really unfair without John McCain involved in this somehow. Animal Practice (NBC, 8 p.m.): The first episode of this show in its regular timeslot was roundly rejected by the American public, so it’s just a matter of time before NBC shrugs and moves Whitney here. In the meantime, Margaret Eby invites you to enjoy the episode “Clean-Smelling Pirate” because why not? The Middle (ABC, 8 p.m.): When Frankie loses her job, she decides to go to technical school. It’s a plot lots and lots of Americans can relate to right now, probably more than they can relate to anything in the debates. Will Harris hopes this ends with her on one of those commercials they run on daytime TV. Survivor (CBS, 8 p.m.): One of the season’s many injury-prone players gets another wound during one of the challenges in this episode. Carrie Raisler strained a hamstring while writing last week’s review of this show, and she’s only a tentative for being around for this one. Just kidding: She’s totally reviewing it. The Neighbors (ABC, 8:30 p.m.): Tonight, the aliens go to a mall! What wacky customs we Americans have will they be incredibly amused by? Or will they just go to a Spencer Gifts and buy a bunch of stuff that says “Over The Hill” on it and/or stuff shaped like penises? Dennis Perkins loves Yankee Candle. South Park (Comedy Central, 10 p.m.): Looks like Trey Parker and Matt Stone are back to watching reality TV and making fun of it, which means that it’s time for the Here Comes Honey Boo Boo episode you knew was coming the second that show was announced. Here comes Marcus Gilmer to review it. Key & Peele (Comedy Central, 10:30 p.m.): The sketch comedians imagine what happened to the guy who had to follow Martin Luther King, Jr.’s “I Have A Dream” speech. We have to imagine it will be awkward and/or hilarious. Steve Heisler had to follow the Gettysburg Address so he can sympathize. Carnivàle (1 p.m.): The next-to-last episode of the show to ever air brings Ben and Brother Justin in vaguely close proximity to each other, which means they’ll probably both tingle menacingly more than usual. Todd VanDerWerff tingles menacingly when he tries to leave his apartment to experience reality. Oh Sit! (The CW, 8 p.m.): All good things must come to an end, and that includes The CW’s “extreme” musical chairs reality show, which airs its season finale tonight. Regrettably, musical chairs fever didn’t sweep the nation, so this is probably the last we’ll see of it. We’ll always remember the summer of 2012. 2012 Presidential Debate (various networks, 9 p.m.): Mitt Romney and Barack Obama have come up with the latest iteration of this weird pilot they keep trying to sell to the networks. Will anybody take them up on this new “we’re going to argue for 90 minutes” idea? We’re guessing… no. Cracking Addiction (TLC, 9 p.m.): A mother and son team try to help people struggling with serious addictions. Tonight, they talk to people with addictions to heroin and meth, and it’s all TLC’s latest attempt to bring the world a day-brightener to close out their Wednesday nights. Life After Top Chef (Bravo, 10 p.m.): As a stopgap between Top Chef Masters and Top Chef proper, Bravo brings you a show about what the Top Chef contestants get up to when they’re not on Top Chef. The answer likely involves being a chef in some manner, but Emily Withrow will let you know for sure. The Crazies (Spike, 7 p.m.): Here’s another installment in our occasional series of movies that some of our critic friends have told us aren’t as bad as their reputations, but we’re just passing that information along without comment because we’ve never seen them. We do like Timothy Olyphant, though! The Hitchhiker’s Guide To The Galaxy (IFC, 8 p.m.): The always enjoyable Martin Freeman stars in this hit-and-miss adaptation of the classic Douglas Adams novel. Zooey Deschanel, Mos Def, and Sam Rockwell join his journey. For fans of the novel, it’s not great, but it sort of gets the job done. MLB Baseball: Red Sox at Yankees (ESPN, 7 p.m.): The only thing the Yankees have to do to clinch the American League East is win this, their last game of the season. The only thing the Sox have to do to make their season not an entire disappointment is prevent the Yankees from doing that. Go On (Tuesday): The Matthew Perry vehicle got a full season yesterday, and Sonia Saraiya is wondering if it’s ever going to iron out its kinks or just keep repeating the same “heartwarming” moments over and over. We’re guessing what this show really needs is to surround Perry with lots of cats again.